Your family dynamics or career choices are changing. Frank Acevedo of Prime Lending will give you the run down on refinancing where you are or qualifying you to relocate to a new location. Sheilah Augustine of Keller Williams will help you find the perfect location. Robert Wilfong of Byrd Home Inspections will make sure you know all you need to know about the structure of the home. Mason Hearn of HomeMasons, Inc. can lay out the plans for any remodeling job you may have. Ginger Rucker of Making It Real will assist with meals until your kitchen is up and running again (but they are so good you will want to keep eating them). Joe Gallagher of OASIS Senior Advisors will make sure Mom and Dad are well cared for either at home with you or placed in a loving center that is just right. Kathy Johnson of Mass Mutual will assist you with your Life, Health, and Disability Insurances so you can stress less. Peter Roughton of Meredith Alvis representing AFLAC will assist with covering the medical costs. Rob McMillin of State Farm will cover your home and auto as well as your business. Laura Yox of Edward Jones will guide you through investing your extra funds for a rainy day and starting that business. Bunny Young of A Better Place Consulting is here to guide you along the way to making your business a success which also leads to a successful personal life. Eric Perkins of Perkins Law, PLLC specializes in small business, franchising, and nonprofit law so you are guaranteed to have the best representation. Shari Himelbloom of A CPA4U, Inc. will help you with your taxes and accounting needs. Yep. BIG Referral Group has you covered. So, if you are in the process of making changes or in a career that requires you to have just the right connecctions then BIG Referral Group is where you need to be. We are looking to expand our group with more services. If you are interested in being a part of this dynamic group, be our guest at the next meeting. Every 2nd and 4th Tuesday of the month starting at 8:00 am and running till 9:30 am located at West Creek Emergency Center’s Conference Room. 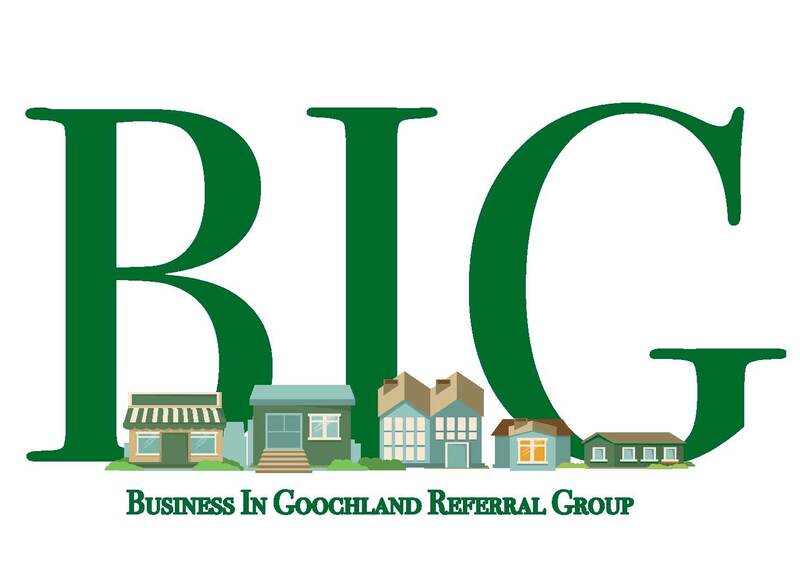 Requirements for being a member of BIG Referral Group are; one, be a member of the Goochand County Chamber of Commerce and two, attend two BIG Referral Group Meetings in a six month period.